You're going to love the New America™! [...] A video of the exchange provided to USA TODAY by Wilharm shows the machine being used on Monday to tell grandfather and granddaughter that the hospital had run out of effective treatments. Annalisia Wilharm needed to restate much of what the the machine communicated, as her grandfather struggled to hear and understand. This is what progress looks like, folks! 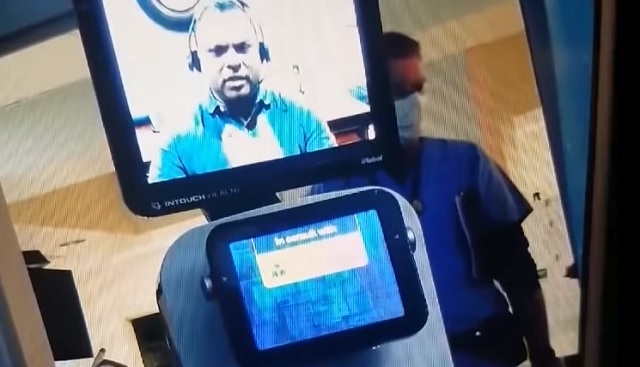 Thanks to the wonder of globalism, all our doctors will soon be replaced by Indian call centers and you'll be asked by robots to "press 1 for drugs" or "press 2 to pull the plug." We need to cut costs and import more cheap labor than ever to help corporate profits!